The Sudanese government has withdrawn its accusations against Egypt and Eritrea of mobilizing military forces along its eastern borders and justified massive military build-up by the Sudanese army in the area of Kassala near Eritrea by saying there were possible threats from Sudanese armed opposition forces, without revealing the nature of these threats. 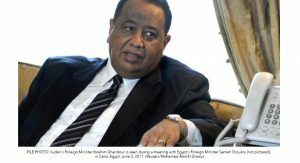 Sudanese Foreign Minister Ibrahim Ghandour said in a joint press conference with his Ethiopian counterpart in Khartoum on Sunday that Sudan was not talking about crowds “set up” by a specific country, but about its security threat in the east. “Some of the opposition forces are present in the eastern part of our country, so we are figuring out what can come from that place,” he stated. Last week, Ibrahim Mahmoud, assistant to the Sudanese president and his deputy in the ruling National Congress Party, said that the authorities received security information about possible threats, which may come from Egypt and Eritrea in the Eritrean area of Sawa. Ethiopia’s Foreign Minister, Workneh Gebeyehu, arrived in Sudan on Sunday on a surprise visit, during which he handed Sudanese President Omar al-Bashir a letter from Ethiopian Prime Minister Hailemariam Desalegn and held a round of talks with his Sudanese counterpart at Sudan’s foreign ministry. Ghandour said he discussed with Gebeyehu bilateral relations and coordination between the two countries on regional and international issues.